In fact, snake meat can be found all across the country. In the southwest, people have been eating rattlesnake for many years. Not only does it help control the population of these venomous reptiles for public safety reasons, it provides a viable food source. In Florida, pythons are an invasive species of snake and a threat to the eco-system, so they are hunted and sold as meat. In some West African countries, snakes are commonly consumed and remain part of the local cuisine. It is also widely eaten in many parts of Asia, such as China, Cambodia, and Vietnam. Here in the northeast, most people would cringe at the thought of eating snake meat. 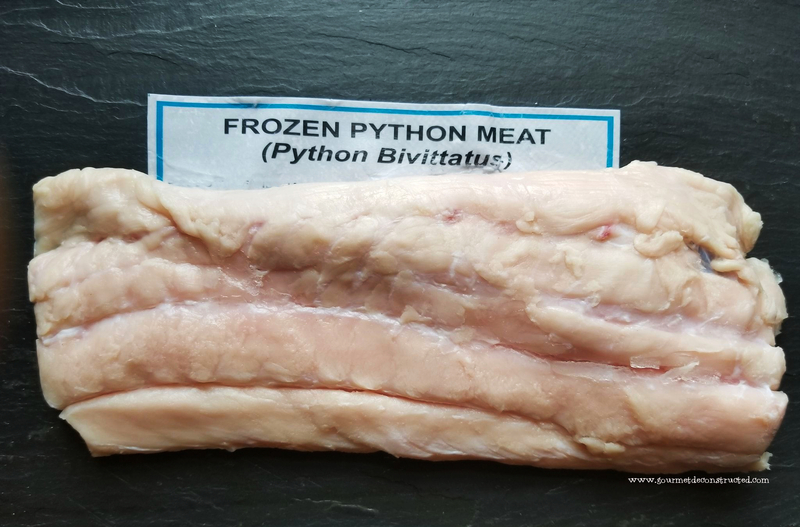 I was quite surprised when I came across frozen python meat in a local market. Fossil Farms has always been one of my sources of wild game meats but I have never seen snake in their freezer section before, so I just had to try it. I thought it was a bit pricey as I paid about $46 for a one pound python filet, but hey this was a one of a kind experience for me. My first instinct was to drop it into a sous vide bath, but with a protein that seemed to have zero fat, I decided against it. 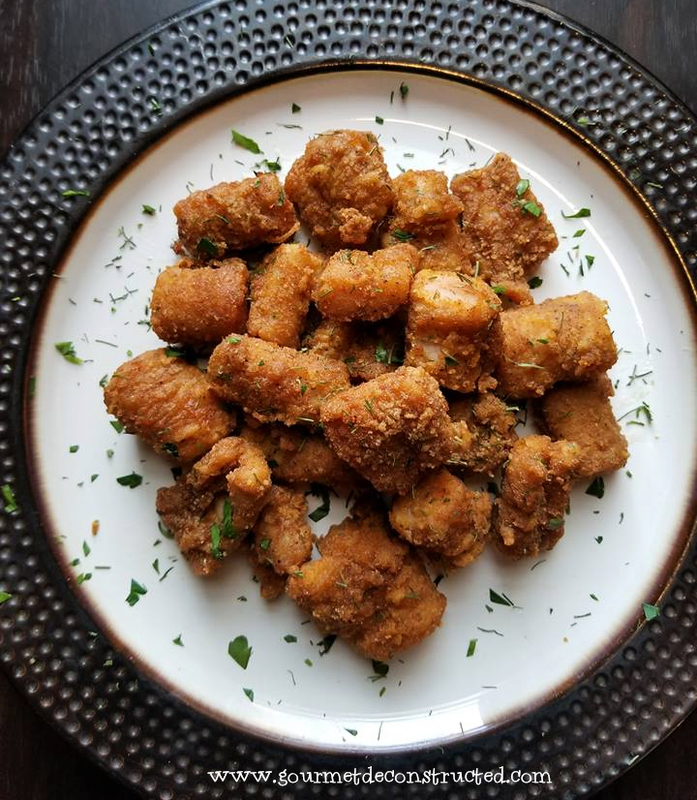 In states like Texas, rattlesnake is usually breaded and deep fried, so this seemed like a quick and easy way to prepare it. 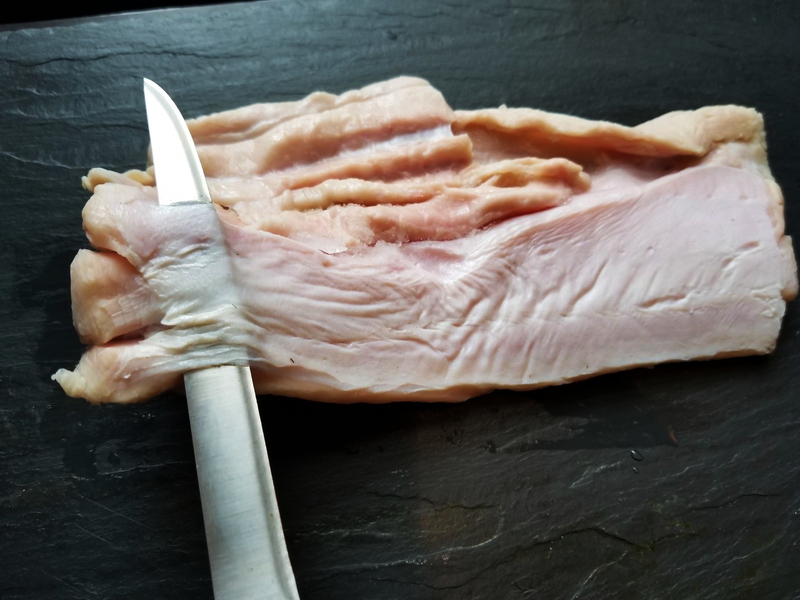 First thing I wanted to do was use a sharp knife to remove the outer membrane to minimize the chewiness of it. 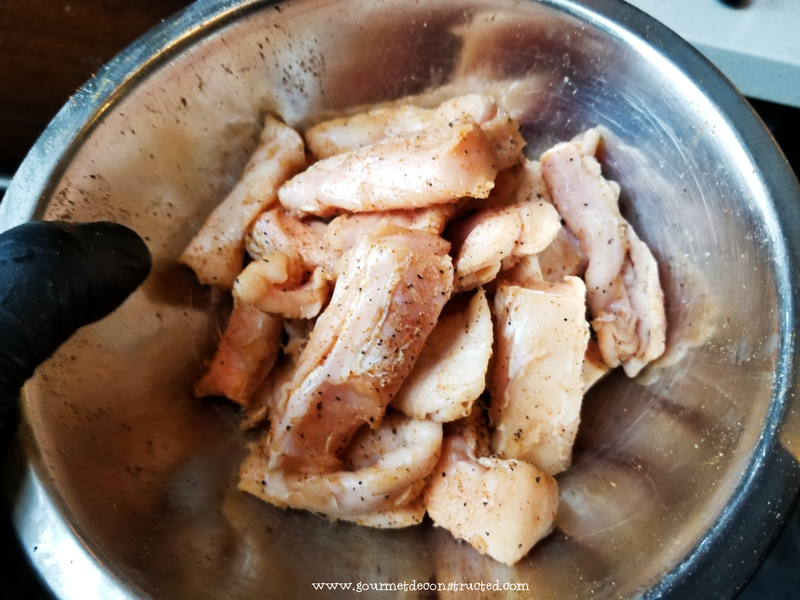 I then cut it into into small strips/nuggets and seasoned it with a Cajun spice blend place it into the refrigerator for 30 minutes before dusting it in flour and frying. The verdict: To my surprise, I didn’t find it strong-tasting or gamey at all; in fact the flavor was mild and resembled frog legs in my opinion. The texture was still chewy but not as bad as I thought it would be. I would cook snake again, perhaps using a different method and a more complex recipe next time. 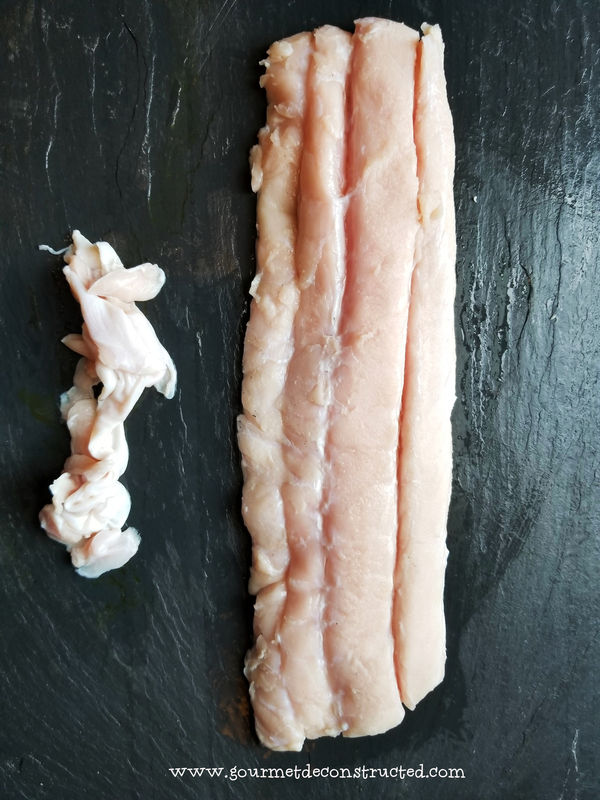 So if you are an adventurous foodie or cook who is not squeamish about trying something new, give snake a try and take a walk on the wild side! In a small bowl combine the salt, garlic powder, paprika, black pepper, onion powder, cayenne pepper, oregano, and thyme until well mixed. In a bowl generously season the python with the spice mix, cover and place in the refrigerator for about 30 minutes. In a heavy bottom skillet or deep fryer pre-heat the oil to 375F. Dredge the python strips in flour and fry for 5-7 minutes or until golden brown and place onto a cooling rack. Serve with hot sauce or the dipping sauce of your choice. Enjoy! Posted on February 10, 2019, in Wild Game and tagged cajun, celebrity chef, Chef Justice, Chef Justice Stewart, cooking snake, deep fry, exotic food, Fossil Farms, gourmet deconstructed, python, python meat, Snake meat, snake recipe, wild game, wild game meats. Bookmark the permalink. 1 Comment. Python! Really not what one would expect to see. Lovely job of work.